This story is the second part in a four-part series about our Halfsy Hero, Andi Hallgren. Our series will follow Andi and three other heroes as they train for the November 6th Good Life Halfsy. Between being a marketing director, teaching fitness classes and fitting in three runs each week, Andi keeps busy. Her schedule is tight. A few days each week she teaches pilates and a spinning class, on Tuesday nights she does track or hill running, she fits in another short run during the week and then powers up for a long weekend run. Some weeks it feels great, others it’s exhausting, Andi said, because the most difficult part of training is finding time for it all. And yet, Andi said the busyness of her schedule has helped her see the value in cross-training. She said it’s been very helpful to stay active each day even if she’s not running every day. It keeps her muscles loose and allows her to engage in lower-impact workouts. Cross-training has also improved her running. Being a pilates and spinning instructor has helped build her endurance as well as her flexibility, core strength and balance. She’s running faster and feels stronger than in years past, but it doesn’t mean that all of Andi’s runs are perfect. 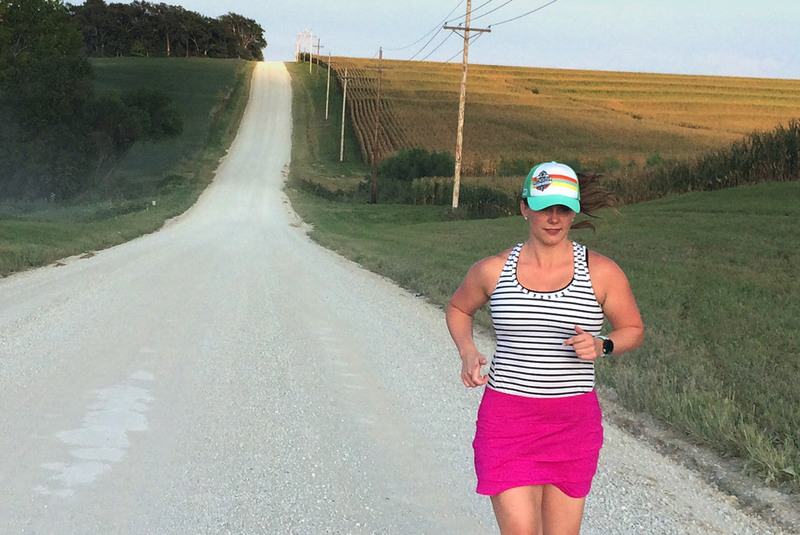 Last week, she said her long run felt uphill the entire way. It was both physically and mentally challenging to push through, and she was thankful to be done with that particular run once she’d met her goal. That’s the thing about training, she said, some days seem easy while others feel more difficult. Andi said she’s seen how other circumstances – work, friends, sleep levels and nutrition – play a big part in the way she runs and trains over a series of months. Before a run, Andi usually fuels up with a natural form of sugar, like fruit. If she’s gearing up for a longer run she pays close attention to eating the right amount of carbs and protein that she’ll need to run eight or nine miles. For the most part, she keeps her diet pretty “clean,” meaning she’s eating natural ingredients that give her body the nutrients it needs. But just because she’s in training mode doesn’t mean she doesn’t have a cheat day every so often. Andi said she’s a total foodie who loves to entertain and cook or try out new restaurants in Omaha, Lincoln or while traveling. It’s about balance, she said, balancing what’s good and helpful with what’s a treat after a lot of hard work. She tries to communicate this to her fitness classes as well as other runners, because running isn’t the only thing Andi does. She’s an aunt, daughter, granddaughter and friend. Running and training is just one of the many things she does with her time. It helps her gain perspective, to slow down and think, and it helps her focus on what matters most in life.